A cop who kept appearing whenever the police were called. 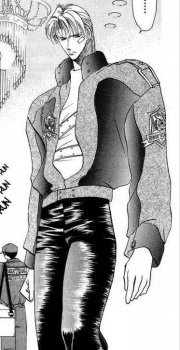 He admired Tsukasa's father, Kozuki Yutaka, and decided to become a police officer after meeting with him. At one point he worried that he was gay since he found Tsukasa attractive before learning Tsukasa was actually a female dressed as a male. Akira has a great hate for the yakuza, especially Kuryugumi who he thinks is responsible for Kozuki Yutaka's death. It was revealed that he was abandoned by his parents and lived in the orphange and had a serial number for his name. He is also a member of the GRAVE section of the Control Police. His partner is Kai Munakata whom he finds unpleasant at first. He is one of the few people who knows that Tsukasa is female, and has an interest in her, even though he's much older. He views Ryuji as a rival and the latter constantly gets jealous over Akira.